The Altai Republic was split off from the neighboring Russian province of Altaisky Krai during the Yeltsin era, partly in recognition of the Altai people’s cultural and linguistic uniqueness, but also because of its geographical difference from the flat farmland and big industrial cities of the Krai. The Altai Republic is home to many people of Russian ancestry, but a third of its population is Altai and speaks the Altaian language. Today’s 60,000 Altaians live predominantly in the south of the republic. They are closely related to Mongolians and are considered the original Turkic people. The Altaians joined the Czarist Russian Empire during the 18th century seeking protection from Chinese and Kazakh invaders, but the Altai didn’t truly attract Moscow’s attention until the 20th century when its farmland and stunning rivers and mountains began to draw ethnic Russians as settlers and tourists. The north of the Altai Republic has a large population of Russians who settled during the communist era on collective farms around the provincial capital, Gorno-Altaisk. Today, many of these ethnic Russians identify strongly as Altaians and also wish to protect Altaian lands and culture. Altaians have traditionally practiced shamanism, Buddhism and Burkhanism or Ak Jang (“White Faith”). Most ethnic Altaians are Burkhanists and belong to family clans that revere totem animals, such as the argali and the wolf, and totem flowers. Burkhanists believe in a three-world cosmology (upper, middle and under) and pray to many spirits, including legendary figures from traditional oral epics. Burkhanists are known for their throat singing practice, in which the singer recounts traditional epics that are very complex and endure for hours. Altaian ceremonies always involved a “feeding of the fire” in which food and alcohol are put into a fire in front of the home as each family asks the spirits to protect the health of the land and water and to continue to provide the family with sustenance. The land is foundational to Altaian spiritualism. Mount Belukha is the highest peak in the Altai Mountains. It has long been a focus of Buddhist and Burkhanist reverence, traditionally called Üch Sümer, meaning “three peaks.” Belukha may be Sumeru, which is the mythical Central Asian mountain of Buddhist belief, the center of Shangri-la (Shambala), where only the spiritually advanced may enter. Several important glaciers crown the mountain and supply the headwaters of the Katun River. Belukha was first climbed in 1914 and now draws many recreational climbers each year. The Ukok Plateau in the south is thought to have been the Elysian Fields (the “Pastures of Heaven” as local people now call it) of the Pazyryk, an ancient Siberian people. There, hundreds of people were buried over many generations. The Greek historian Herodotus reported that the Scythians (as he called the Pazyryk) were a race of fierce warriors in the Asian steppes that kept a sacred burial ground in the high eastern mountains. One of the kurgans (burial sites) is that of the famous “Ice Maiden” or “Ukok Princess”— a young and powerful female Pazyryk warrior. In 1993, archaeologist Natalia Polosmak uncovered the 5th century B.C. woman who had been buried in a larch wood chamber with six sacrificed horses. The frozen mummy was removed from the site for research in Moscow, was then on display for years in a museum in Novosibirsk, and has recently been returned to a museum in Altai. The Katun River is central to the spirituality and culture of the Altaians. Originating from the glaciers atop Mount Belukha, the Katun forms the beginning of the magnificent Ob’ River, Russia’s fourth longest river which empties into the Arctic Ocean. The Katun itself supports astounding biodiversity. Indigenous Altaians conduct many ceremonies in honor of the river and have used traditional ecological knowledge to protect the quality of the river and life in and along it for millennia. In the southern section of the Altai, there are multiple large Nature Parks recently carved out by the republic’s government in cooperation with local communities dedicated to preserving both culture and biodiversity. The oldest park was established ten years ago and the youngest only two years ago. There are active proposals to expand existing parks and add new ones. The parks are at the beginning of a long, difficult process: administrative resources and money are scant, management plans are mostly nonexistent, and powers of rangers are not clearly defined. There are daily problems with poachers of plants and animals, and with large numbers of what are locally known as “wild tourists”— people who seek adventure in the world’s most remote places. However, the parks’ directors and the Altai government are currently working to safeguard their lands and ensure sustainable tourism. Large-scale tourism has come to the Altai in the last ten years, with the removal of domestic travel restrictions and the growth of private car ownership as well as the increasing interest of East Asian travelers in the Russian steppe. Many of these new vacationers have limited understanding of stewardship ethics, so incidents of environmental damage in parks or on local peoples’ land are increasing. In establishing a park, the consent of local people living within the park or using it for seasonal livestock grazing is necessary by law. Local support for parks is growing. Parks are seen as a way for Altai people to preserve their environment and culture, to increase local livelihoods, and to continue traditions of common land use and management as much of Russia’s land become privatized and fragmented. The Altai Republic, primarily through the efforts of the local NGO “Ene Til,” has petitioned Moscow to become a special tourist area (which would give the local government the ability to regulate its parks and assess tourist taxes). A recent proposal by Russia’s state-owned gas company Gazprom to build a natural gas pipeline to China has roused local concern. One proposed pipeline route crosses the Ukok Plateau, the biodiverse nature park and site of ancient burials. Due to a failure to reach agreement over the price of gas, the pipeline proposal has been postponed in recent years but a deal now may be immanent. Gazprom survey crews were seen on the Ukok Plateau in summer 2011 staking out the pipeline route. 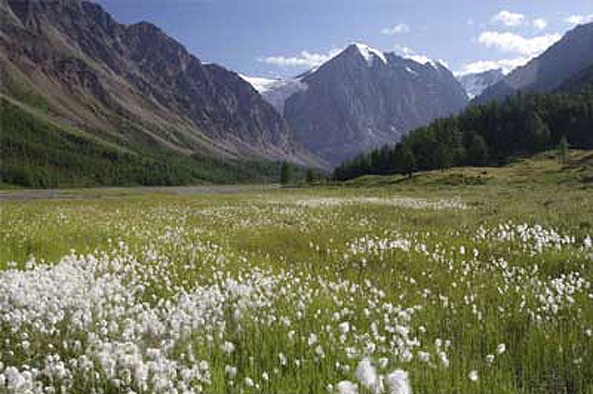 In August 2012, the Altai Republic issued a decree giving Gazprom permission to begin construction work on the Ukok Plateau within the Ukok Quiet Zone Nature Park. The decree also approved pipeline construction in Uch Enmek Nature Park in central Altai. Organizations including Greenpeace-Russia and Save Ukok Coalition have filed legal and regulatory complaints in response to the Altai Republic’s decree. Also, the Altai Republic’s Prosecutor’s Office overturned a June 2012 decree for the preservation of Altai Republic’s sacred sites. This decree had been widely praised and was considered an important step forward in protecting the Altaian people’s cultural and spiritual traditions as well as the physical landscape itself, banning most resource extraction, economic development and other potentially harmful activities. However, in a letter to the Russian Ministry of Natural Resources in May 2013,, Gazprom stated that it “has not made a final decision to build the Altai Gas Pipeline across the Ukok Plateau, that it is not currently working on the project, and that there will be no funding allocated to the project in 2014 and 2015.” However the company has not cancelled the project as indicated by its hosting an international conference to discuss major oil and gas infrastructure projects in Gorno-Altaisk that included a delegation from China. On May 21, 2014 Russian President Putin signed an historic $400 billion gas deal with the Chinese government that was negotiated over 10 years. Under the 30-year contract China will receive 38 billion cubic meters of gas per year supplied by a $22 billion pipeline linking Siberia’s gas fields to China. The gas is expected to start flowing in the next 6 years. The route of this new pipeline has yet to be determined, and will likely enter China in the east. But Russia and China continue to negotiate and a second pipeline through Altai’s Ukok Plateau is still a very real possibility. In June 2014, Altaians reported disturbing news from the site of a proposed cobalt mine in Karakul, east of Koch Agach near Altai’s border with Mongolia. The land has already been test drilled more than 120 times with more extensive drilling in the works. Eventually, mining operations, with the accompanying processing plant, mining village, service roads and spoil heaps, threaten to disturb a vast area. This land is extremely fragile, and the mine will be a significant disturbance to endangered argali sheep, which may be cut off from their winter grazing habitat. Support the Gorno-Altai based Foundation for Sustainable Development of Altai (FSDA), which is leading local efforts at community organizing, cultural renewal, environmental protection, international education and sacred site protection. The Altai Project of Earth Island Institute works to support sustainable economic development in Altai, alternative energy development, protection of snow leopards and their habitat in part through anti-poaching education, with many able partner organizations. For more information on the World Wildlife Fund’s activities to protect the Altai-Sayan region, and the endangered snow leopard, contact their Altai office. In summer 2007, Sacred Land Film Project filmed in the Altai Republic for our upcoming series Standing on Sacred Ground. Watch a video of our pilgrimage to a sacred mountain in the Üch Enmek Nature Park, and visit our News & Blog section for updates and report from the field. Halemba, Agnieszka.“Power in places and politics in Altai.” Agnieszka Halemba. Paper presented at the Fourth Nordic Conference on the Anthropology of Post-Socialism, Copenhagen, Denmark, April 2002. Klubnikin, Kheryn, Cynthia Annett, Maria Cherkasova, Michail Shishin, and Irina Fotieva. “The Sacred and the Scientific: Traditional Ecological Knowledge in Siberian River Conservation.” Ecological Applications Vol. 10, No. 5, October 2000. United Nations Educational, Scientific and Cultural Organizations. “Golden Mountains of Altai.” UNESCO World Heritage Centre. Vinogradov, Andrei. Ak Jang in the Context of Altai Religious Tradition. Thesis submitted to the Department of Religious Studies and Anthropology, University of Saskatchewan, 2003.